That’s how long it has taken for another American attempt at a Godzilla film after Roland Emmerich’s critically-maligned 1998 blockbuster. With up-and-coming director Gareth Edwards (Monsters, and soon-to-be director of Star Wars), a star-studded international cast and a massive budget, all of the pieces appeared to be in place for a proper reboot. Yet while impressive in spots, Edwards’s Godzilla unfortunately manages to be underwhelming overall. Much of this disappointment comes from the array of one-note human characters that we spend most of our time with. However, the film’s intro, set in 1999, starts off on a strong note. We are introduced to the Brody family, that being plant supervisor Joe (Bryan Cranston) and his wife Sandra (Juliette Binoche), as well as their young son, Ford. While working together at a Janjira nuclear plant, Joe and Sandra are caught in the middle of a massive seismic catastrophe. As their town crumbles around them, the government steps in and attributes the disaster to a large earthquake. If only that were true. Janjira is quarantined, and the survivors are forced to move elsewhere. Flash forward fifteen years. Joe is still living in Japan, often sneaking into the quarantined area in an attempt to find new information on what really happened that fateful day years ago. His son, now a Navy bomb disposal technician (played by an emotionless Aaron Taylor-Johnson), believes his father has gone crazy (as does everyone else). This all changes once a gigantic insectoid monster emerges from the underground, sending all of Japan (and eventually Hawaii, the Bay Area and Las Vegas) into a panic. Yet even after this introduction of a giant creature, the film still spends most of its time focusing on the less interesting humans on the ground. New characters are brought into play — including members of the U.S. Navy (because ‘MURICA!) — but they have no real development, and there’s little in the way of action. Godzilla himself doesn’t even make an appearance until more than halfway through the movie. When he ultimately hits land, the film finally kicks into gear. Godzilla’s fight scenes are spectacular, and the destruction he causes is truly impressive (as is his guttural roar). Edwards and company absolutely nailed the monsters, and their visual effects are a treat on the big screen. If the film focused more on these aspects, it would be a real winner. However, as touched on earlier, too much time is spent with oft-mundane characters. Ford, who is given the most screen time, is about as generic of a lead as there is. He does little to differentiate himself from the rest of the soldiers, and there’s no clear reason to care about him. Throughout the film, he has a ton of run-ins with monsters that are pure happenstance. His character really takes a beating, but I had no vested interest in him. The supporting cast is composed of an absolutely terrific group of actors, but all of them are frustratingly wasted. Bryan Cranston is great as always, but his character’s role is sadly truncated when the film moves to present day. Ken Watanabe and Sally Hawkins play scientists who should have critical parts in the film, but both are afterthoughts. Watanabe’s character is constantly pushed over by the Navy, and Hawkins has maybe three lines of dialogue at the most. Come to think of it, all of the women cast in the film play completely disposable characters. Elizabeth Olsen, who plays Ford’s wife, is just there to fret and worry over her husband. I’m not even sure why Juliette Binoche was cast, as she gets just five minutes of screen time. Perhaps all of the humans should have just been scrapped from the get-go. In Godzilla, they are just ants to be stepped on, not mattering at all in the grand scheme of things. It’s a shame then that the film has placed so much emphasis on them. 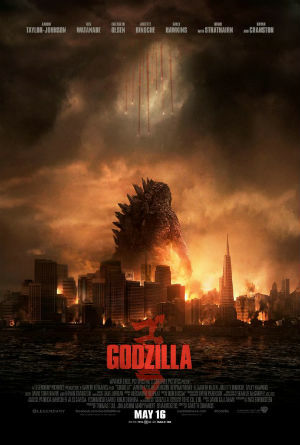 Godzilla is at its best when cities are destroyed and monsters are tossing each other around. There is a damn good hour or hour-and-a-half long movie in here somewhere — it’s too bad this is two hours. Damn, I wish they gave Olsen more to do. I keep reading how underused she is. I also read there initially was supposed to be a female protagonist, shame they didn’t do that. I think I’ll catch this on DVD. Yeah, all of the women in the film were completely wasted. Olsen, Hawkins and Binoche are all incredibly talented but they have nothing to work with in this. Such a shame. Good review Eric. It’s all about the build-up with this here Godzilla and it’s what worked for me the most. The characters may have not been all that interesting, but at least the cast seemed like they were really trying. It’s just disappointing since the film could have been so much better with even a little bit of effort into developing the human characters. Nice review. 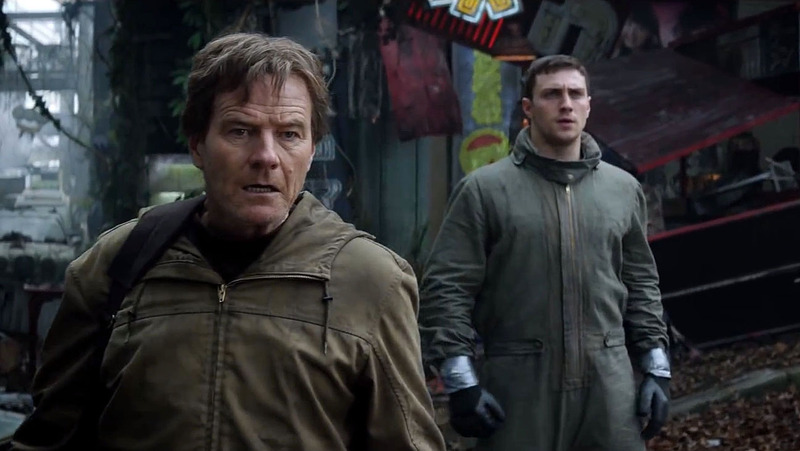 I agree that the characters, with the exception of Cranston’s role, are pretty one-note, but the monster fights redeemed the movie’s faults. This got rid of the bad taste from the 1998 version for me. Yeah, the monster fights definitely helped make up for some of the film’s shortcomings. It just baffles me that they would bring in such a strong cast and give them so little to work with. Aaraon Taylor-Johnson definitely could have used some work, but the rest seemed decent enough. Again, for me. Hey Tom. Glad you enjoyed the film so much. I think my biggest problem was that so much time was spent with the humans even though they meant absolutely nothing in the end. If the film had been more consistent in its narrative or even just loosened up a bit rather than trying to be so serious, it would have been all the better for it. But I do have to admit I loved the giant battles in the final act. Yeah, the human element isn’t the best here. But it was what I expected, even with the calibre of talent involved. Ken Watanabe spent most of his screen time looking ponderously into the distance with a hint of terror. I enjoyed the film. I liked how they brought it back to Godzilla being a balance in nature, rather than the one causing the ruckus. Heh, glad I’m not the only one who noticed Watanabe’s lone expression throughout the entire film. Usually Hawkins was standing right next to him with an equally quizzical look. Wish they had juicier parts, but I guess that’s to be expected in a major blockbuster like this.